Looking for the next delicious recipes for your end of summer barbecue? Chef Tom Cooks recipe blog provides just that. Chef Tom posts recipes ranging from all sorts of seafood creations, to burgers, to salad dressing mixes. You are sure to find something that will compliment your next meal and inspire you to prepare a new dish for your guests. Our friend Tom, from Chef Tom Cooks has grown up with the love of cooking and enjoys cooking for all different types of crowds. He continues to share some of this favorite recipes and cooking tips to other cooking enthusiasts. We, at Sharper Uniforms, agree that Z Best Pizza Burgerz recipe sounds absolutely delicious! 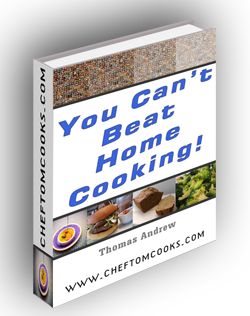 Make sure to stop on over Chef Tom Cooks recipe blog and you’re even welcome to download his own cookbook, You Can’t Beat Home Cooking! while you’re there visiting!